Alavi Bohras - Akhbaar - "Aywaan-e-Fakhri"
“We have created you male and female and we have formed you in different tribes and folks (with varied hereditary traits) so that you could identify one another. Surely, the most honoured among you near Allaah Ta’aala is he who is the most righteous (and not the fame and power of a tribe or race) among you. Truly, Allaah Ta’aala is All-Knowing and All-Aware." "The best thing which a man is supposed to be gifted by Allaah Ta’aala is “Faith”, but this Faith is naked, its dress is Piety (taqwaa), its beauty is Shyness (sharam), its wealth is Jurisprudence (fiqh) and its fruit is Deed (‘amal).” Faith has nothing to do with parental merits or ancestral traits. Faith is purity and piety." The Supremacy of the people of the family of Da’i is not based on its relationship with Da’i but on ikhlaas, khidmat, ‘ilm and taqwaa. The 6 sons of Saiyedna Fakhruddin saheb (aq) were all learned with the ‘Uloom of Da’wat-e-Shareefah like the sons of Saiyedna Taiyeb Ziyauddin saheb (aq). They were Saiyedna Badruddin saheb, Bhaisaheb Ibraahim, Bhaisaheb Hameeduddin, Bhaisaheb Najmuddin, Bhaisaheb Abd ul-Husain and Bhaisaheb Husaamuddin. The children of these 6 brothers formed large number of Ashaab, Ma’mooreen and Zumrah of Da’wat-e-‘Alaviyah. Since the intiqaal of Saiyedna Fakhruddin saheb (aq) in 1347 AH-1929 AD, the saff-e-awwal of the ashaab of Da’wat-e-Shareefah comprises of the family members of Saiyedna Badruddin saheb and his brothers as per their ‘ilmi-‘amali merits and khidmat. al-Maulaa al-Muqaddas Saiyedna Taiyeb Ziyauddin saheb (aq) coined a word “Aywaan-e-Fakhri” means the Fakhri Arcade or a Place where ahl of Fakhri Khaandaan assemble and strengthen their ancestral relationship with Love and Respect. al-Maulaa al-Muqaddas wished that this would happen during his time but time had some other way to reveal. 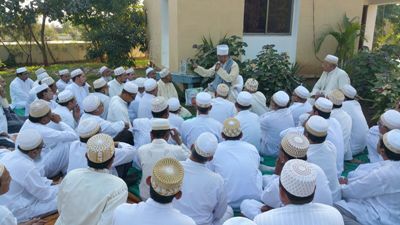 The khwaab of al-Maulaa al-Muqaddas turned on to reality when Saiyedna Haatim Zakiyuddin saheb Aqaa Maulaa (tus) expressed his wish to the members of Fakhri Khaandaan to come together to make some meaningful move for the Jamaa’at Mumineen in order to revive the glory of “Aywaan-e-Fakhri”. After the maghrib-‘ishaa namaaz Aqaa Maulaa directed all of them to come forward and carry over the Khidmat of Da’wat as their fathers has done. Also to come with some fresh ideas and good planning for the khidmat of mumineen which could be carried out under the banner of “Aywaan-e-Fakhri”. Copyright © 2015 Alavibohra.org All rights reserved.